Image from Suffolk Chronicle and Mercury newspaper. 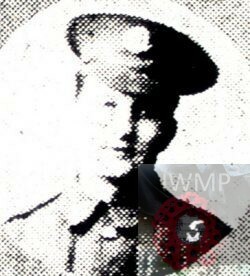 Died: 22nd February 1915; age 23; KiA. Employed: at the International Tea Stores, Ipswich. Regiment: Duke of Cambridge’s Own (Middlesex Regiment) 2nd Battalion. Brother to ERNEST GEORGE BREWSTER & HAROLD FREDERICK BREWSTER. Harry was 9 years old and living with his parents & siblings. Walter Henry Brewster, 57, a Baker – own account, born Carton Colville, Suffolk. Jane Brewster (nee Morphy), 47; born Ipswich. 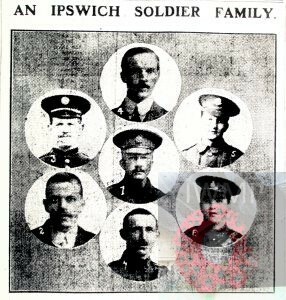 Gertrude Emily Brewster, 20 a Dressmaker – own account, born Ipswich. Albert William Brewster, 18, a Corn Miller, Great Bromley, Essex. Ernest George Brewster, 16, a Commercial Clerk, born Christchurch, Middlesex. Arthur Charles Brewster, 12, born Ipswich. Alfred Brewster, 11, born Ipswich. 1911 No. 1, Dacre Place, Newgate, Beccles, Suffolk. Harry was 19 years old and a Grocer’s Assistant at the International Stores. He was a boarder with Robert Norman & his family. Soldiers’ Effects to Jane & Walter Henry Brewster – parents. Harry is also remembered on the war memorial at St. Margaret’s Church, Ipswich and on his parents headstone at Ipswich Cemetery.